"Great location for a quiet holiday, good facilities for self..."
Have a question for Millennium Smile Pension? 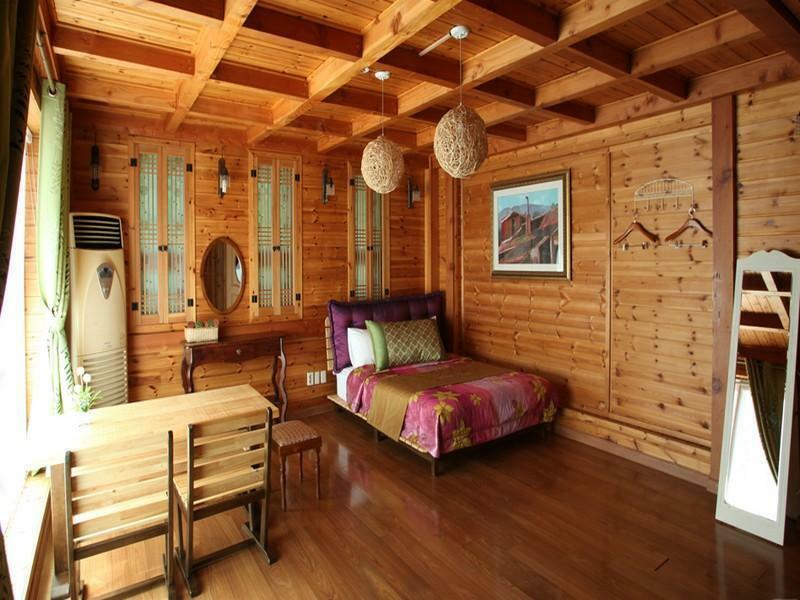 "Clean, well maintained, nice owners"
Well-positioned in Bomun-dong, Millennium Smile Pension is the ideal point of departure for your excursions in Gyeongju-si. From here, guests can enjoy easy access to all that the lively city has to offer. With its convenient location, the hotel offers easy access to the city's must-see destinations. Millennium Smile Pension offers impeccable service and all the essential amenities to invigorate travelers. For the comfort and convenience of guests, the hotel offers free Wi-Fi in all rooms, daily housekeeping, express check-in/check-out, Wi-Fi in public areas, car park. In addition, all guestrooms feature a variety of comforts. Many rooms even provide television LCD/plasma screen, internet access – wireless, non smoking rooms, air conditioning, heating to please the most discerning guest. Besides, the hotel's host of recreational offerings ensures you have plenty to do during your stay. Millennium Smile Pension is your one-stop destination for quality hotel accommodations in Gyeongju-si. "The staff is responsive, friendly and helpful." Staff was very kind and room was clean and big, however it was far from town center and a bit cold without heating at night. This area is FULL of stuff to do!! Toy Village, Temples, Museums, Parks...you name it! There's fishing nearby (bring your own fishing pole though), and the pension is comfortable and cute. The AC, internet, Cable tv, BBQ, kids play pool etc were all great. Plenty of cups, but not many plates. The staff is responsive, friendly and helpful. A little hard to find by address searching the GPS provided by the car rental company - and some narrow back roads to navigate. Great location for a quiet holiday, good facilities for self catering and easy access by car to groceries etc. You really want your own transport for holidaying at this location. Great time. only 1 bus (may be 3 - but not the same direction) to/from there. Pretty good to be there. Very kind staffs and they were really helpful. Room was clean and view was beautiful. 매우 만족하며 돌아오셨습니다. 숙소안에 편백나무향도 좋다그러시고 뷰가 너무좋앗다하시네요. 평일에 가서 엄청 저렴하게 예약 했는데요, 가격이 저렴해 의구심을 갖고 도착했는데 정말 좋았어요. 깨끗하구 대부분 다 갖추어져 있더라구요. 특히 사장님 엄청 친절하시구 불편함없이 머물었네요! 항상 어디를 가든 수건이 모자랐는데 수건도 넉넉하고! 대신 물은 여유있게 사가셔야 할듯. 주변도 조용해 편하게 푹 쉬다가 온 느낌이에요. 2박 했는데 하루 더 쉬고싶다 하는 생각 들었네요 조용하고 생각보다 벌레도 거의 못봤어요 밖에서 들어온 나방정도? 바베큐도 가능한데 저희는 그냥 가스버너에 고기불판해서 구워먹었어요! 더 편하고 좋은듯ㅎㅎ걱정없이 예약하셔도 될듯 합니다~! 위치가 일단 호수 옆이라 아침에 자고 일어나서 보는 창밖 풍경이 너무 좋았어요. 저희가 늦게 도착했는데도 사장님이 너무 친절하게 안내해주셔서 참 감사했습니다. 위생상태도 좋았고 살짝 쌀쌀했던 거 빼고는 모두 좋았어요~~^^즐거운 경주여행에 큰 역할이 된 숙소 였습니다. 호스트 분들은 친절하신거 같은데....방음, 위생, 난방시설이 열악함... 너무 시끄러워 새벽2시반까지 잠못자고 고생함. 침대에 장판은 있으나 추워서 옷껴입고 잠. 위생용품은 샴푸, 치약만 있어서 여자들이 샤워하기에는 열악함. 주말이라 가격은 12만원. 평일에 조용할때 가면 좋을듯. 2층에서 보는 뷰는 좋았음. 차타고 조금만 나가면 식당, 커피숍,편의점이 많음. 불국사도 가까움. 워터파크와 불국사 사이에 있어서 일부러 이쪽 위치를 찾아봤던 것이었음. 괜찮은 가격에 넓은 방, 넓은 침대, 침대 전기담요, TV, 부엌, 식탁까지 다 있어서 너무 좋았는데 딱 두가지 단점은 좁고 빈약한 샤워실과 근처에 가게가 없다는 것. 차타고 좀만 나가면 편의점있지만 저녁8시인가, 10시인가(생각안나는데) 문 닫힘. 거기서 조금만 더 나가면 다른 가게가 있기는 함. 전체적으로 다 괜찮았음.